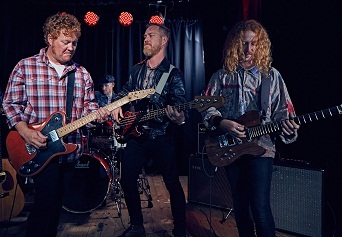 Let the Black Lapels transport you back to the late 60’s and early 70’s by performing their sell-out and incomparable musical tribute to the Creedence Clearwater Revival Band. The CCR show allows the Black Lapels to crank up the amps and head full tilt into this not to be missed performance! The set list includes all your favourite hits including, Fortunate Son, Looking out my Back Door, Down on the Corner, Up around the Bend, Born on the Bayou, Green River and many more. Highlights of the show include intimate renditions of CCR classics like Lodi performed solo by Lapels front man Rob Warren. The Lapels rhythm section featuring Garth Warren (bass) and Gareth Gale (drums) keep the set moving along at an energetic pace and Rusty Red (lead guitar) reproduces CCR guitar lines with minimum effort! All of this adds up to The Black Lapels finest work to date! Shows take place on November 10 and 11 at 20h00 and November 12 at 14h00 and 18h30. The venue opens 90 minutes before show for picnic dinner. Tickets R150 (R130 pensioners and tables of eight or more).